Everyone has seen the Wizard Of Oz! The musical was one of the first films to prove that the expensive Technicolor process could be profitable. Studio head Louis B Mayer (of MGM) demanded the film be as colourful as possible. The teams crafted every scene to be as impressive as possible. The costume team designed every costume with Technicolor in mind. The quest for perfect outfits and makeup lead to some odd, and often dangerous, costume quirks. Here, we have a look into the wonderful world of Oz’s costume department, character by character. 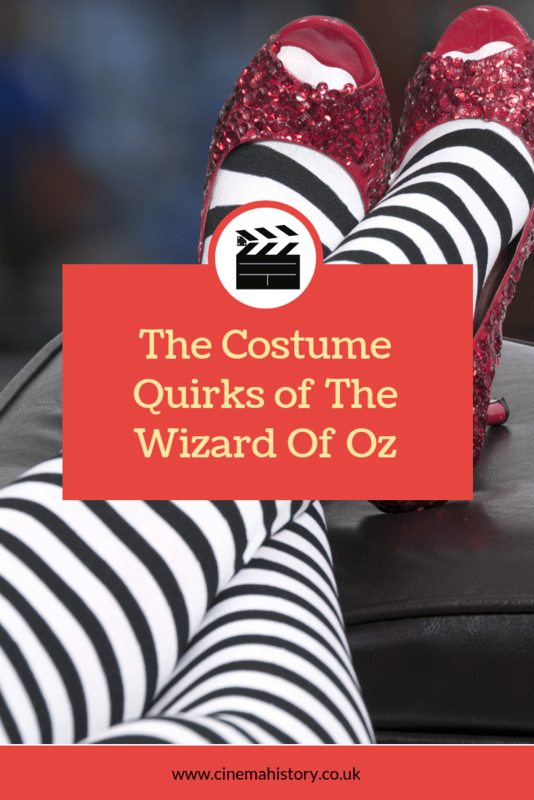 The most famous costume quirk of all is Dorothy’s shoes. In the original book, her shoes are silver. Mayer asked for a brighter colour to show off the new Techicolor technology. While its thought that the costume team made seven pairs of the iconic shoes, only five are known to exist still. Due to the film’s popularity, these shoes have an estimated value of around $1.5 million per pair. A less well-known quirk is the famous Gingham dress. Dorothy’s costume in the film is blue and white. But to get this to work with the Technicolor system, the white parts on her dress were a pale pink colour. The use of another colour is probably due to the lights in the studio needing to be bright; any white fabric would look burnt out. Adrian designed The Witch’s costumes to look as evil as possible. The dress used tricks such as puffy sleeves and big skirts to make her frame look much more significant. The tall hat intended to make her height seem more imposing on Dorothy and the Munchkins. The black fabric was a stark contrast from the to the over-saturated colourful set. It made her stand out against the happy feeling of Munchkinland. The same costume tricks used to enhance the fear could also be used to make her look vulnerable. During the famous melting scene in the Wizard of Oz, her hat gets swapped for a bigger one. It made her body look much smaller and weaker as she melted. Margaret Hamilton’s experiences on the set of The Wizard Of Oz were not enjoyable. During her dramatic exit from Munchkin Land, the fireball set her costume alight. She sustained severe burns that took a few weeks to heal. When she returned, she wore gloves to cover her hands, which were still recovering. Hamilton refused to work with more pyrotechnics. The studio arranged for a stunt actor to film a scene with a smoking broomstick. The prop exploded and injured the stunt performer. It wasn’t only costume problems that Hamilton suffered. The makeup used was copper based. It’s unclear how toxic this makeup is, but Hamilton couldn’t consume food and had to drink through a straw. The team removed the paint with alcohol. The removal was incredibly painful when they tried to clean the paint from her burns. The green pain stained her skin for weeks after filming wrapped up. After all this, test audiences felt that the witch was far too terrifying for children. The studio cut most of Hamilton’s scenes to tone it down. The witch wasn’t the only one who’s makeup stuck around after shooting finished. The Scarecrow also fell victim to long-lasting makeup. The foam latex prosthetics left lines on Ray Bolger’s face for a year. On the subject of makeup, the Tin Man’s facepaint almost killed an actor. Buddy Ebsen was the actor first to take on the Tin Man role. When he came to shoot, the actor began to experience bouts of short breath. Ebsen also started to get cramps. His health deteriorated, and he soon ended up in hospital. The diagnosis was aluminium dust on the lungs. The makeup artists used aluminium dust on top of glue to give the Tin Man his shiny silver look. They topped up his makeup at short intervals. He had breathed in quite a lot of dust. He left the production to recover, and Jack Haley replaced him. The makeup team began using an aluminium paste instead. While it stopped the breathing problems, Haley suffered an eye infection instead. The costume team used actual lion fur and skin for Bert Lahr’s Lion costume. The costume was extremely hot to wear. As mentioned earlier, they used bright lights on the production. Bright lights give off a lot of heat, which can be difficult for actors in regular clothes. Temperatures in the studio reached 37ºC/100ºF. On top of the heat issue, the latex foam makeup wasn’t flexible enough for the Lahr to fully open his mouth. Like Hamilton and Haley, he couldn’t eat while in the studio and had to drink his meals through a straw. At the beginning of the film, Dorothy runs away. She discovers Professor Marvel, who begins to read her fortune. The costume he wears is shabby but smart. The MGM costume department scoured second-hand shops for the right coat. After a few costume tests with actor Frank Morgan, they settled on an outfit. During shooting one day, Morgan sat fidgeting with his costume. His hand wandered into one of the pockets and pulled out a label. The label said “L. Frank Baum”, the name of the author of original The Wizard of Oz book. Production staff all repeated this story to the press. Some even claimed that the original tailor had sent proof that Baum had indeed bought it. However, this “proof” is not available for public view. A story as big as this would still exist in MGM archives. It wasn’t unusual for studios to invent stories like this for films. So it’s most likely this is probably a publicity stunt that’s become an urban legend.